This is truly a one dish meal – the vegetables (of your choice, below) are roasted under the chicken, and the drippings defatted and served along side. Couldn’t be easier; couldn’t be better! Sunday Roast Chicken, Lemon Variation for Easter 2015. Look for ways to “divide and conquer” and – use a larger protein like this as the basis for another meal or two later in the week. “Sunday” dinner (about $6.36), more expensive, becomes more reasonable when a chicken salad or casserole is served as a second meal, and a soup as the third. Left over vegetables make a marvelous puree as a side dish later in the week. A big chicken like this will generate a good amount of lovely Chicken Stock or Broth (save any drippings that aren’t used for dinner to add to the stock) and when I have a good stock, I think SOUP, usually Chicken Noodle Soup or Pho Ga, two soups absolutely dependent upon a good stock. When I make the Lemony variation, I can’t wait for a bowl of my Chicken & Rice Soup! 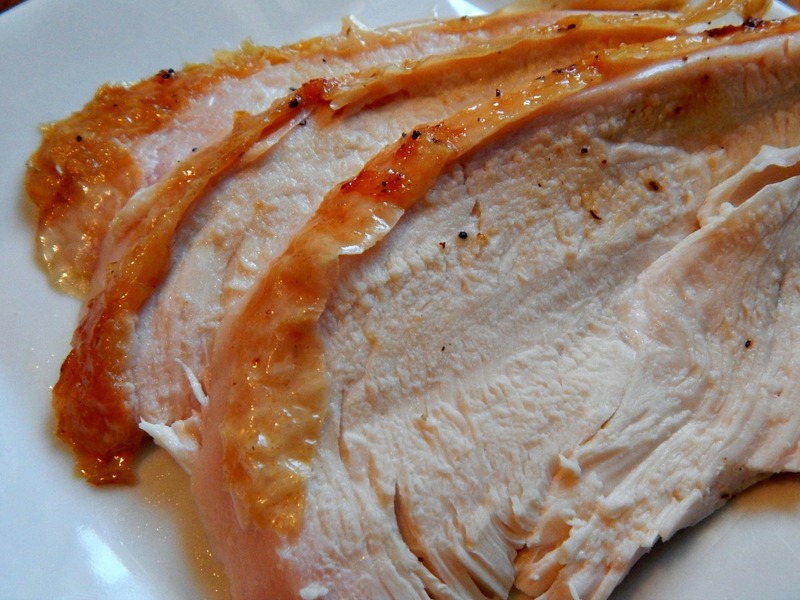 Sunday Roast Chicken – this is just so perfectly juicy. “Regular” variation. Herb of your choice: sprig of tarragon, rosemary, thyme, marjoram or a sprinkling (pinch or two) of dried. Vegetables of your choice according to season and availability: Potatoes, sweet potatoes, Rutabagas, Parsnips, Fennel, Butternut Squash. Cut into 2 1/2 to 3 inch chunks. Allow an appropriate number per person. Preheat oven to 425 degrees, put shelf on lower middle position. Prepare chicken: wash if necessary and remove any pin feathers, remove giblets and neck (if there.) Salt and pepper the inside of the bird. Stuff with the peelings from the onions, a lemon if desired, fennel fronds (if using fennel) and herb of your choice. Truss your chicken – see my post on How to Truss a Chicken in One Minute for slides. Bake about an hour and a half until the thigh registers 165 to 170 when a thermometer is placed in the thickest part of the thigh. Be careful the thermometer is not hitting a bone.) In a smaller oven, it may be necessary to rotate the chicken halfway through the cooking process so it is cooking evenly on all sides. Remove Chicken from pan, place on a platter, tent lightly with foil and rest for 20 minutes. Remove vegetables and place with chicken. Defat juices and pass with the chicken. If desired, after defatting chicken juices, pan may be deglazed with a cup of broth or water, scraping up browned bits. Bring up to a boil, reduce heat slightly and simmer five minutes or so to concentrate flavors. Strain, pressing on any remaining solids. Taste for seasoning. Note: Check the vegetables now and then throughout the cooking process to make certain they are not getting overly dark or in danger of burning. Add a bit of water to the pan if necessary. The lemon flavor can very easily be brought forward in this dish – Use two lemons, one sliced and one whole. Zest the whole one, then cut in half. Squeeze the juice of the cut lemon and reserve. Add the two squeezed halves to the inside of the bird. When laying down the vegetables, add the slices of lemon. Mix zested lemon with about a tablespoon of butter, a 1/4 teaspoon salt and pepper and work under the skin of the breasts, as far down into the leg as possible. For sauce, add the reserved lemon to the drippings and reduce as suggested in the recipe. A bit of white wine for deglazing would be wonderful. What to do with the left over carcass? Make Stock then Soup! This entry was posted in Click here for Bargain Meals, Click here for Fabulous Food Posts and tagged Bargain Meal of the Week, Carrots, Chicken, complete skillet meal, Fine Cooking, Lemon, planned leftovers, Roast Chicken. Bookmark the permalink.